Omnipollo / Buxton Yellow Belly Peanut Butter Biscuit Stout. My daughter brought this for me from the BeerJerk people for my birthday, and obviously it is a treasure of a beer, but it’s just a beer and after so many months in the fridge the time has come. 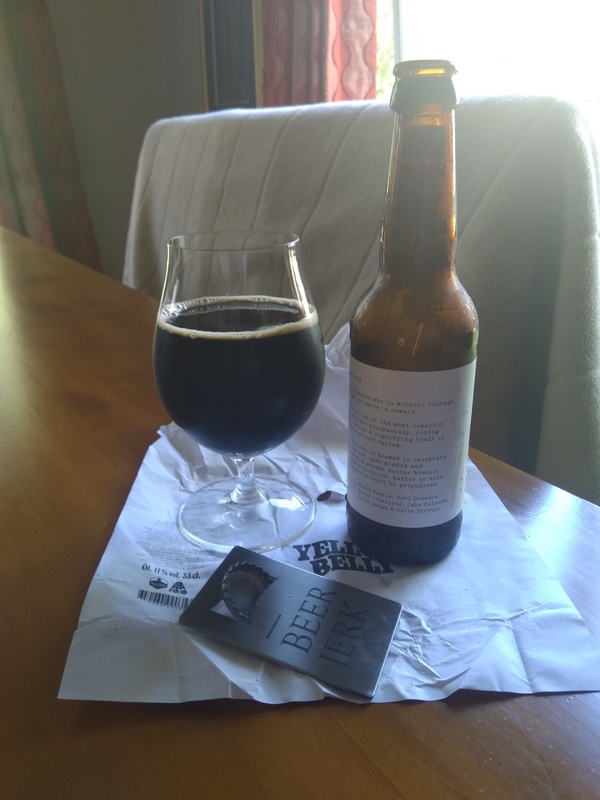 Mysteriously, cleverly, interestingly, intriguingly packaged 330ml bottle of a beer that is 11% ABV, so thats around the 330 calories a serve size, this would be 2.6 standard drinks in NZ. 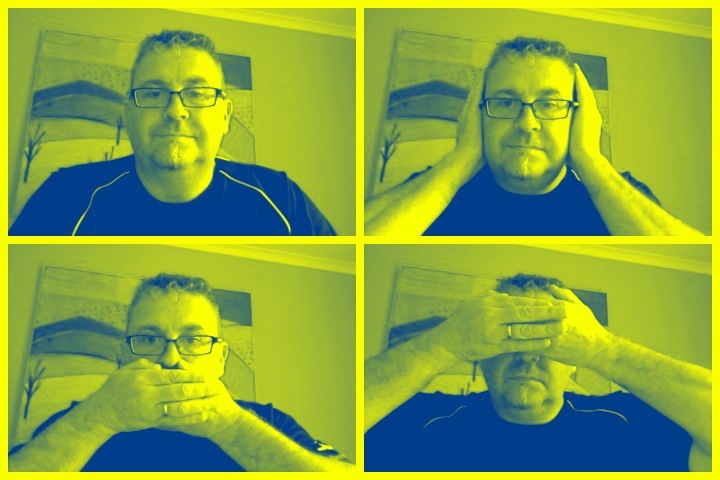 “Yellow belly” — a person who is without courage, fortitude, or nerve; a coward. That’s an outstanding aroma, dial upto 11, chocolate, biscuit, milky somewhat, I should stop now it’s love at first whiff. A brown mahogany and of colour pour that sits flat without head in the glass like a dark almost flat cola drink. The aroma has changed, it’s less intense, and different again, more smokey this time, there’s something quit catchy on the nose too, pepper prickly, it might just be me. Heavenly , absolutely top notch, outstanding taste from this. Deep rich and full, over a lingering bitterness at the finish, that lingering is sweet and deep at the same time, incredible. There’s an alcohol burn that creeps back up and sits there warming, and this might just be just too bitter to be a clean sweep no argument 10, so more (or even a) head, and a notch back on the bitterness would have done this for me. I could have given up beering. There’s a god reason that this has been in the fridge some 6 months, because this really could have been a treasure. I’m going to bang on again about how rich it is, with a really reined in sweetness carried over an underlying bitterness that ends with a prickle and then a warmth. Like magic. The pdubyah-o-meter rates this as 10 of its things from the thing. There’s something special about a beer that starts as one thing and gets better. As this warms it changes character to get sweeter, more peanut buttery and less bitter. A sipping beer of the first water. Where did I get it? This was a birthday gift, so many months ago. Would I have another? Although hideously expensive and rare if i could I would probably fridge another. Would I share with a friend on a porch and set the world to rights? Share! are you mad!, but of course yes, this would be an ideal share and tell beer with a few friends, it’s a sipping beer, not to be quaffed or adulterated in other ways, a perfect beer. Music for this: ” Wandered Away by Anna Leone on spotify, from a google search of whats good Scandinavian music in 2018 🙂 Google comes through again. 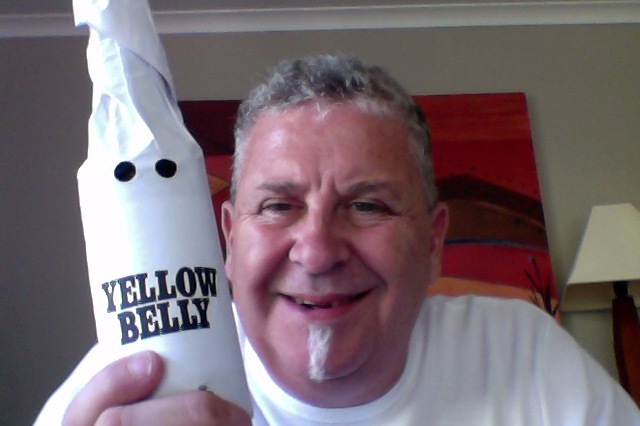 This entry was posted on January 2, 2019 by Philip Walter in Beer, Beer of England, Beer of Sweden, Beer Review, Brewed By, Buxton, Craft Beer, Critic, Imperial Stout, Omnipollo and tagged Omnipollo / Buxton Yellow Belly Peanut Butter Biscuit Stout, Omnipollo Yellow Belly, Yellow Belly.